York Hog Roast Catering and professional caterers are available 24/7 to provide our York clients with a range of the finest hog roast, pulled pork and BBQ catering services in the area. We mainly focus on the York and North Yorkshire areas, only serving free range locally sourced Hog Roasts for outdoor or indoor events and catering for Birthday parties, family gatherings, businesses or Wedding catering. All our ingredients are fresh, homemade and catered by our Yorkshire family-run business. Our chefs and Hog Roast catering team have served and catered at a great number of events over the year's in York and our experience has proven that there is only one way to create the very best barbecue food; the secret to our success is that we only use the very best ingredients. We've always worked this way with locally sourced produce and Hog Roast meat that is of premium award-winning catering quality. Our Yorkshire Hog Roast and BBQ produce may all be sourced in and around York, but this has allowed us to win national awards accrediting us with the status of serving some of the best Hog Roast and Barbecue catering food in Britain. If you hire a Hog Roast for your event you'll benefit from serving small to large amounts of guests with really great food, and we'll always make sure the costs stay well within your budget. With our Hog Roast catering team having so many years of experience, we always notice at every single event how much impact a Hog Roast has with the guests! Leaving a great impression with wow-factor food means your event is always exciting and more memorable, our York Hog Roast and Barbecue Catering doesn't just look good - the aromas of the slowly cooked tender meat smell amazing and the taste is divine. As the food cooks, the hungry spectators gather and once tender and fully cooked, we load up a bread bap or roll full of home-made fillings, toppings and mouthwatering meat to make the most fulfilling meal available. With more and more outside events being catered each year, we have noticed a steady increase in demand for York Hog Roasts and Hog Roast catering options. The versatility of the Hog Roast is we can serve the food indoors too if required, making it perfect for all types of events including Wedding catering, York parties or Birthday gatherings. A really wholesome Hog Roast always keeps the guests happy! So why is there such an increase in York Hog Roast popularity? We suspect it could be down to York's medieval and historic setting, making a rustic Hog Roast suit both themed Medieval banquet style parties as well as more contemporary special occasion catering. With the Hog Roast being ideal for all types of catering service, we are happy to serve premium BBQ food at any festivity also including seasonal events like Halloween, Bonfires, Christmas Parties or New Year. Even businesses are increasingly contacting us for catering options such as for Corporate catering events, open days, product launches and team building projects. A York Hog Roast is perfect at any time of year too! Our York Hog Roast Caterers provide the wedding catering at over 150 weddings each year, providing our well-trained chefs with a vast amount of wedding catering experience. One thing they notice each and every time serving for a wedding is the reaction and reception of our Hog Roasts and BBQ catering provided - make your event more memorable with our York Hog Roast Catering service. We make sure to only use free range produce for our barbecue and hog roasts, all perfectly cooked. Menus and the dishes served can be customised exactly to meet our clients and their guest's needs for any event or occasion. Contact our Hog Roast caterers York catering team now to book hog roasts or barbecue food for your York party or wedding day. Our York Hog Roast Catering team has a track record of winning Wedding Catering awards and nominations. We've been winners for the last few years now, which isn't surprising as we cater over 150 weddings in the York area each year. Our professionally trained cooks and chefs have built up a huge amount of Wedding catering experience in York. Our team can help to make your big day even more memorable and add a show-stopper of a Hog Roast into the mix! We also make sure to only use local free range produce in our Barbecue and Hog Roast food which is always perfectly cooked on your Wedding day or for the reception. Why Choose Hog Roast Catering in York? 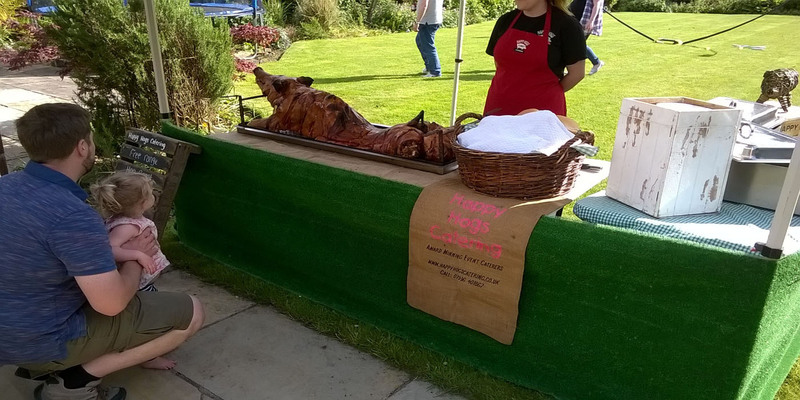 Sometimes a Hog Roast may seem a different catering choice and lots of people wouldn't think to go down the Barbecue catering food route for an event - but Hog Roasts and BBQs in York are actually the ideal choice and should not be overlooked. The food is hot, wholesome and fulfilling - as well as being completely mobile, neutral to any style of event or time of year. Not only this but it can also be served inside or outside. We can provide a full table dinner service or more casual BBQ catering where guests can stand and walk around with their food. The choice is yours and our menus can be customised and adjusted to your exact needs, we can even create bespoke menus and dishes to suit your event. The flavours and tastes are always fresh and the meat is as tender as can be, our pulled pork and Hog Roasts melt in the mouth! Our food will leave your guests with that tantalising smoked meat and juicy BBQ flavour to die for! Your event is bound to be remembered if you hire a York Hog Roast or BBQ catering option. York Hog Roast Catering are pleased to have now won ‘The North of England’s Wedding Awards’ in the caterers category, going up against Exclusive Caterers Dine from Sarah Beeny’s wedding venue Rise Hall and Michelin star dining from Box Tree Catering previously owned by James Martin celebrity TV chef and many other event caterers, wedding caterers and Yorkshire caterers.